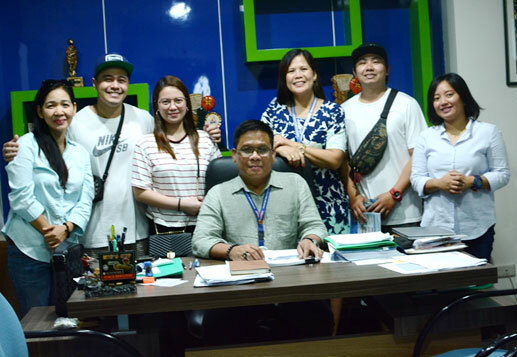 The Metropolitan Naga Water District (MNWD) has another reason to celebrate aside from the upcoming Peñafrancia Festival 2018, as the organization lauds the official appointment of its Management Leaders. On September 3, 2018, the MNWD community together with Chairman of the Board of Directors Jorge T. Palma confirmed Engr. Virgilio B. Luansing I, General Manager A alongside Shirley B. Peña, DMA-Customer Accounts Services Division, Christina B. Carmona, DMA-Financial Management Division, Vicente Aniceto D. Rubio, DMA-Environment and Water Resources Division, and Edgar B. Caballero, WDRD-Supervising Water Utilities Management/Development Officer. Their official appointment in the leadership positions signifies the commitment of the organization towards the attainment of performance excellence and operational sustainability of the MNWD. Indeed, the oath taking ceremony was a sight to behold and a glorious celebration for the entire MNWD community as we receive an early blessing from Our Lady of Peñafrancia. Meanwhile, in preparation for the feast of Our Lady of Peñafrancia 2018, the MNWD joined the City Government of Naga in the citywide clean-up activity last August 25, 2018. A hydration station was also set-up during the Alay Ki Ina ceremonies last August 31 at the Basilica Minore. This is an annual traditional activity facilitated by the Bicol Catholic Charismatic Renewal Service (BicCCRES). OATH TAKING. The MNWD community celebrates the official appointment of GM Virgilio B. Luansing I (left picture) together with Vicente Aniceto D. Rubio, DMA-Environment and Water Resources Division, Shirley B. Peña, DMA-Customer Accounts Services Division, Christina B. Carmona, DMA-Financial Management Division, and Edgar B. Caballero, WDRD-Supervising Water Utilities Management/Development Officer (2nd picture – right to left). HYDRATION STATION. The MNWD will set-up drinking stations with the use of these portable drinking fountain throughout the Peñafrancia Festival 2018. IN HONOR OF “INA”. The MNWD would like to thank Paul H. Capucao – CDRRMO Naga City (2nd from right), Ted H. Capucao – Long Beach Marina, Singapore (2nd from right), and Agatha Mae Ordiz – Cleveland Clinic Abu Dhabi (3rd from left) for their partnership to provide Goto (porridge) during the Peñafrancia Festival 2018.